The Hulaville Players who brought us the popular “Dylanesque” revue return with another themed evening, “Troubadour: The Singer/Songwriters of the 60’s and 70’s.” Led by Sonny Silva and Jon Osorio, their performance in HPR’s Atherton Studio on July 16 features imaginatively rearranged and recast music of James Taylor, Kenny Rankin, Laura Nyro, Neil Young, Joni Mitchell, Antonio Carlos Jobim, Donny Hathaway, Cat Stevens, Roberta Flack, Stevie Wonder, and others. Reservations for “Troubadour” in the Atherton on July 16 may be made online at www.hprtickets.org or by calling the station (955-8821) during regular business hours. Tickets are $30 general, $25 for HPR members, and $15 for students with ID; plus online service charge. The Atherton Studio is located at Hawaiʻi Public Radio, 738 Kāheka Street. Doors open at 7:00 p.m.; music begins at 7:30 p.m. The other Players include Duncan Kamakana, balladeer from television’s "The Voice"; song and dance man Jonathan Sypert; jazz vocalist Rachel Gonzales; Hawaiian lap steel virtuoso and singer Greg Sardinha; and a rhythm section from the Hot Club of Hulaville: Sonny Silva, Duane Padilla, and Aaron Aranita. Co-hosting the evening with Silva is Hawaiian Renaissance music legend Jon Osorio. Jon Osorio (co-host/vocals/guitar) is a composer, singer and recording artist from Hilo, Hawai‘i. He currently lives in Pālolo with his long-suffering wife Mary and a number of children who are better known and more talented than he. Jon has an interesting day job teaching at UH Mānoa’s Center for Hawaiian Studies and involving himself with unpopular causes. His song “Hawaiian Eyes” won a Hōkū in 1981. Sonny Silva (bandleader/guitar) is a jazz and classical guitarist, composer, playwright, and show producer from Honolulu. He has studied with Sonny Chillingworth, Davis Ramey, and Jeff Linsky. 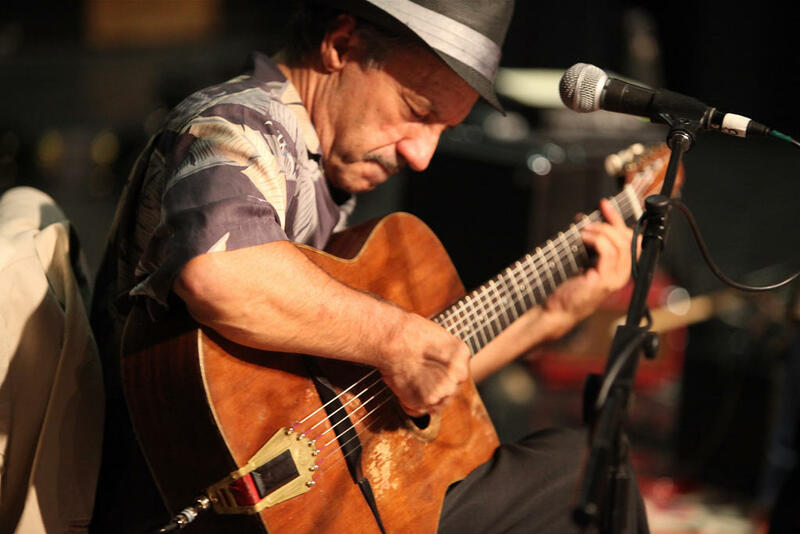 Silva has performed on both coasts, toured Japan and Asia, and has been featured in Europe from France to Portugal. He formed the Hot Club of Hulaville, which won a Nā Hōkū Hanohano award in 2011 for Best Jazz Album: "Django Would Go!". Duane Padilla (violin/mandolin) is an internationally acclaimed concert artist and educator, who began his career as an orchestral musician, performing with the National Repertoire Orchestra, the Tanglewood Music Center Orchestra, the New Haven Symphony, and the Honolulu Symphony Orchestra. He is a founding member of The Hot Club of Hulaville. An equally accomplished educator, Padilla is currently on faculty at the Punahou Music School and serving as Vice Chair of the American String Teachers Association Eclectic Styles Committee. Rachel Gonzales (vocalist) is a Hawaiʻi native and widely regarded as one of the best and most versatile of Hawaiʻi's singers and musicians. She is fluent in all musical languages, be they jazz, pop, or classical. She has performed extensively throughout the state, including frequent appearances at HPR, as well as at Duc's Bistro. She teaches voice and guitar at the Masaki School.